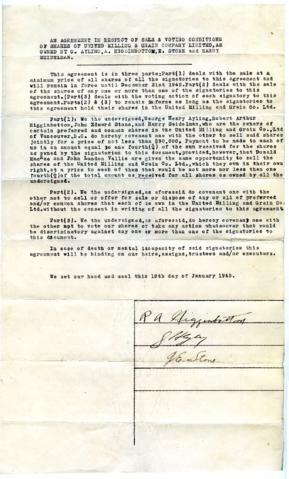 An agreement in respect of sale and voting conditions of shares of United Milling and Grain Company Limited, as owned by G. Ayling, A. Higginbottom, E. Stone, and Harry Seidelman. Agreement is dated January 10, 1945. Document contains three signatures.